State owned mobile network operator NetOne yesterday joined the fight against cholera with massive donations delivered in the Budiriro constituency. Budiriro has become of the leading residences breeding water borne diseases due to the poor provision of basic social amenities such as clean water and sanitation in the area. NetOne Executive – Dr. Eldrette Shereni and Chief Commercial Officer – Brian Mutandiro shake hands after conducting a massive clean up at Karen Shops in Budiriro 1. NetOne’s Dr. Eldrette Shereni leads her team at Karen Shops in Budiriro 1 during a thorough clean up of liter scattered behind grocery stores posing health dangers to the local community. 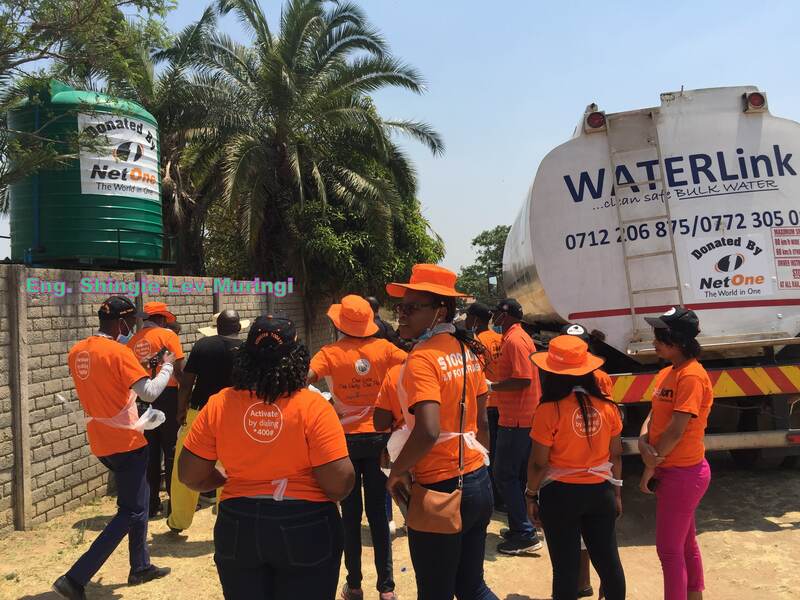 NetOne’s Chief Commercial Officer – Brian Mutandiro leads a section of the cholera campaign team in clearing liter dumped flee-markets at Budiriro 1 shopping centre. A NetOne employee ties knots on full bin liners containing liter cleaned from Budiriro 1 Shopping Centre. A Budiriro resident stops by St. Faith Anglican Church to quench his thirst from clean water gushing from a tape connected to a 1,000 litre tank donated by NetOne. NetOne’s Brian Mutandiro washes his hands from clean water drawn from an erected water tank donated by NetOne in Budiriro 5 section.